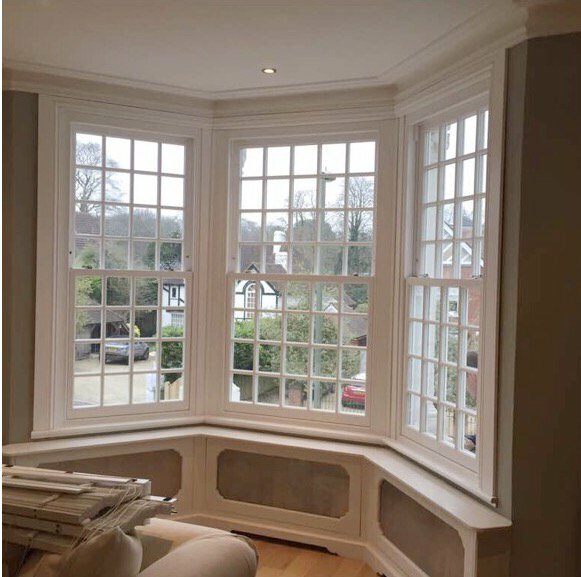 Guild Home Improvements specialise in the supply and installation of hardwood and softwood timber windows. Our high quality, factory finished timber windows are available in a wide range of colours using microporous paint and stain finishes to suit any home. Our timber windows are sanded by hand and fully prepared before each stage of the paint process. Colours can be matched to any colour sample provided, you can even have an internal colour and a different external colour. There are many different timber window options to choose from and GHI’s timber windows can be manufactured fully bespoke to suit any situation, including listed buildings. GHI’s timber windows come in two choices of frame depth, 69mm and 90mm. Modern design accommodates modern shootbolt handles and multi point shootbolt locking mechanisms for high security. Stainless steel friction hinges facilitate ease of opening and easy cleaning. With GHI’s range of timber windows you can mix period elegance and style with modern technology. Noise, weather and draughts can all be kept at bay by full double glazing and weather seal systems. Choose from sealed units or double glazed units in either 28mm for storm proof systems and 24mm in all other systems, both provide optimum thermal performance in your home. Our customers can also rest assured that with our sustainable timber purchasing and forest certification we are taking care of the environment. And our traditional timber window ranges are also compliant with building regulations.